You can use the auto configure tool to sync your upload settings in your uploader app. This is one way to easily set up REST API and ensure you get the proper syntax for the string. To use the auto configure tool, go to: http://nightscout.github.io/pages/configure/. 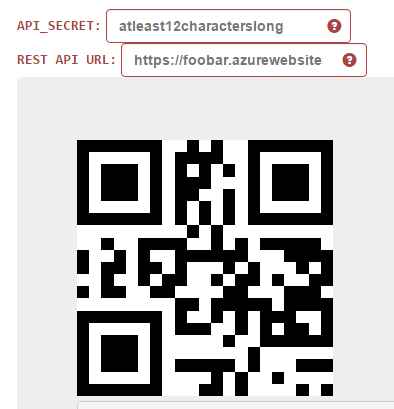 Enter your 12-character (minimum) API_SECRET value in the first box. Once a 12-character minimum API_SECRET and a base url are both entered, the boxes will turn green. In your uploader app, choose the “auto configure” option and use your uploader phone’s camera to scan the QR code.